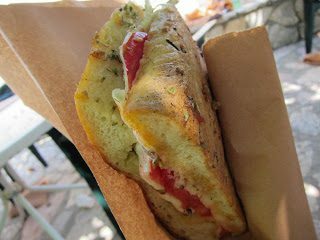 Ever since returned from a vacation in Italy last summer, these sandwiches are my “GO TO” meal for summer. They’re easy to fix and then transport to wherever your picnic destination is located. Split open your ciabatta bread and drizzle each side with olive oil. Add thick slices tomatoes, mozzarella and 1-2 basil leaves on one side. Sprinkle with S & P, and place in the oven at 350 degrees for about 5 minutes. Remove from the oven, and place on tin foil, and wrap each sandwich individually. Place in your picnic basket and you are all set. These will be so good!